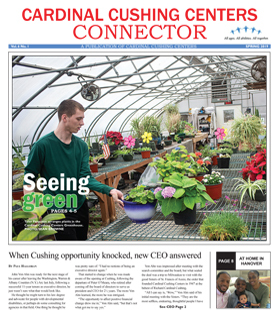 For more than twenty years Cardinal Cushing Centers in Hanover has been utilizing our Challenge Course to help enrich lives. The Cardinal Cushing Challenge course helps our students and adults increase their sense of personal confidence, build mutual support within a group, and develop an increased level of physical coordination. The program has been valuable tool, helping others learn how to work together in a group while practicing the basics of problem solving. Over the years we have used our course with our employees to increase their cooperation within departments and it has proven to be very helpful exercise in fostering team work. Our program is based on challenge by choice, meaning everyone is encouraged to participate though we never force our participants to do anything they are not comfortable doing. All we ask is that you try and be a participating member of the group. A one day Challenge Course Team Building program would include several lead up activities to help the group begin to work together to solve simple initiatives. Success is not important as long as the group is working together towards a common goal. Second, we provide an introduction to the basic equipment used for the challenge course. Many of our challenge elements are located 10-15 feet up in trees; technical rock climbing safety precautions are used. This equipment and techniques include safety harnesses, helmets, climbing ropes, carabineers and belaying equipment. Safety is always a priority with any challenge course operation. 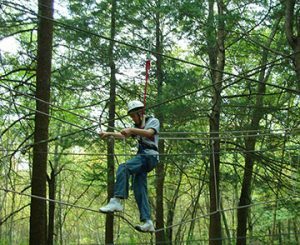 Our challenge course is licensed by the Commonwealth of Massachusetts Department of Public Safety. It is inspected yearly by Project Adventure and our staff regularly attends trainings through Project Adventure, Inc.